Into a mixing bowl large enough to hold a pound of cole slaw mix and 12 ounces of corn, add the ranch dressing, yogurt, 1/4 teaspoon of cayenne pepper, and a teaspoon of sea salt. Whisk until well blended. Into a saute pan, add the canola oil, corn, 1/4 teaspoon of cayenne pepper, and 1/2 teaspoon of sea salt. Cook while stirring frequently on medium high heat for three minutes. 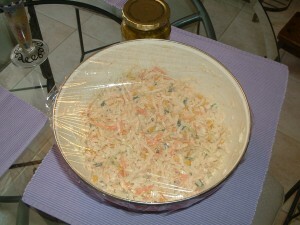 Add the corn, cole slaw mix, and the scallions to the mixing bowl that contains the dressing. Mix all of the ingredients thoroughly. Taste and add more sea salt and/or cayenne pepper if needed. Note: You can add tabasco sauce at this point, if desired. Brush the poblano peppers with the canola oil. Sprinkle 1/2 teaspoon of sea salt and the black pepper on the peppers. Put the poblano peppers on a baking sheet and roast in the oven for 45 minutes. Cook the instant polenta in the 2 1/4 cups of water and 1/2 teaspoon of sea salt according to the package instructions. When the polenta is cooked, turn off the heat and stir 1/2 cup of the cheddar cheese into the polenta. When the poblano peppers are cool, cut a slit lengthwise down the center of each pepper and remove the stem and the seeds. Peel any charred skin off of the peppers. Place an equal amount of polenta in each pepper. Fold each poblano pepper up and place the peppers in a greased baking dish. Top the poblano peppers with the remaining cheddar cheese. Cover the baking dish with aluminum foil. Bake in the oven at 350 degrees for 45 minutes. Combine all of the ingredients into a food processor. Pulse until smooth. If the mixture appears too course or dry, add more olive oil a little at a time to achieve a smoother consistency. Taste and add more sea salt and/or black pepper if desired. Serve on your favorite pasta, grilled chicken, or grilled salmon. Into a mixing bowl large enough to hold two pounds of potatoes, add the potatoes and olive oil. Mix so that each potato wedge gets coated with the olive oil. Note: Add more olive oil if necessary. Add the sea salt, paprika, oregano, cayenne pepper, garlic, and parsley. Mix well to incorporate all of the spices. Spill the potatoes out evenly in a single layer on a baking sheet. 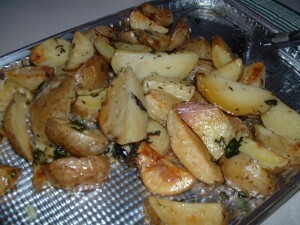 Bake in the oven until the potatoes are browned (about 1 to 1 1/2 hours). When the potatoes come out of the oven, sprinkle more sea salt and/or cayenne pepper if desired. Into a small mixing bowl, add the paprika, the sea salt, the garlic powder, the black pepper, the cayenne pepper, the onion powder, and the dried oregano. Mix well until blended. Lightly coat one side of the sea scallops with the spice mixture. Note: You will not need to use all of the spice rub. Place any leftover spice rub into a jar and save it for future use. Heat a non-stick saute pan on medium high heat for three minutes. Add the oil to the pan. Note: You will know when the pan is hot enough to begin cooking when the oil begins to smoke a little. Place the scallops in the pan spice side down. Cook without touching for four minutes. When a brown crust is formed on the spice side, turn the scallops over. Cook for an additional two minutes. Turn the heat off. Into a small mixing bowl, add the paprika, sea salt, garlic powder, black pepper, cayenne pepper, onion powder, and dried oregano. Mix well to combine all of these spices. Place a small amount of the spice mixture evenly on the flesh side of the salmon filets. Note: You do not need to use all of the spice rub. Save any leftover spice rub in a jar for future use. Put a non-stick saute pan on medium high heat for three minutes. Add the canola oil to the pan. Note: You will know when the pan is hot enough to start cooking when the oil begins to smoke a little. Place the salmon filets flesh side down into the saute pan. Let the fish cook without touching for three minutes. Turn the fish filets over to the skin side. Finish cooking in the pre-heated oven for 15 minutes. The skin should be brown and crispy. Serve with lemon wedges and/or basil pesto suce. Add the garlic, basil, 1/2 teaspoon of sea salt, and the black pepper to the beaten eggs. Whisk the egg mixture thoroughly. Heat a 12 inch skillet on the stovetop on medium high heat for three minutes. Add the olive oil, asparagus pieces, the crushed red pepper flakes, and 1/2 teaspoon of sea salt. Let the asparagus cook without touching for 6 minutes. After 6 minutes, turn the asparagus and let the other side cook for two minutes. Arrange the asparagus pieces evenly in the skillet. Add the egg mixture. When the egg mixture begins to cook along the edges, place the skillet in the pre-heated oven. These mushrooms are a perfect accompaniment to a good steak. Into a mixing bowl, add the sea salt, pepper, garlic, shallot, and balsamic vinegar. Whisk until well blended. While whisking, slowly drizzle in the olive oil. 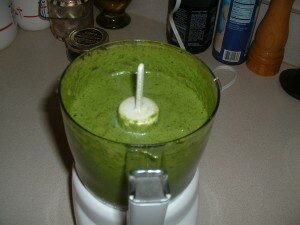 Continue to whisk until the dressing is well blended. Add the mushrooms, parsley stalks, and thyme sprigs to the dressing. Mix well so that the mushrooms get well coated. Let the mushrooms marinate for at least a half hour. 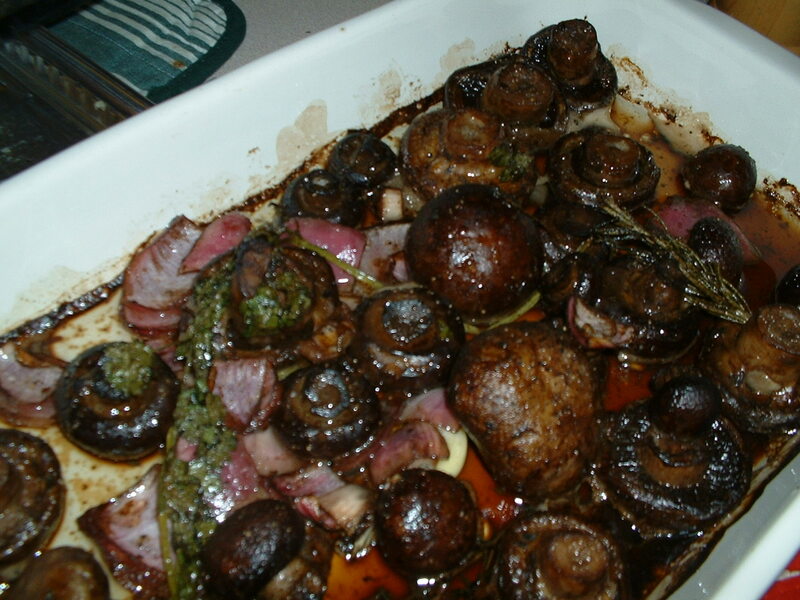 Pour the mushrooms into a shallow baking dish. Roast in the preheated oven for 30 minutes. Cook the lasagna noodles in a pot of boiling water with 5 teaspoons of sea salt for 6 minutes. Drain the noodles and let them cool. Into a mixing bowl, add the ricotta cheese, mozzarella cheese, Romano cheese, parsley, garlic powder, the beaten egg, a teaspoon of sea salt, and a teaspoon of ground black pepper. Mix with a spoon until well blended. 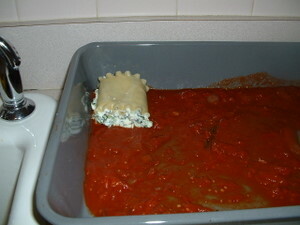 After the lasagna noodles have cooled, spread them out on a flat surface. 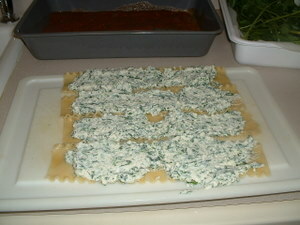 Place approximately four tablespoons of the ricotta cheese mixture evenly in the center of a noodle and roll it up (going right to left). Continue this process with each noodle until all of the cheese mixture has been used up. Place half of the tomato sauce evenly on the bottom of a casserole dish. 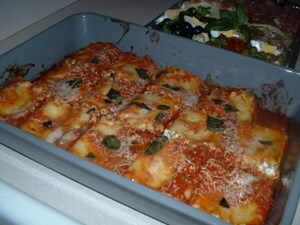 Lay the lasagna rolls on top of the tomato sauce seam side down without touching. Cover the lasagna rolls evenly with the remaining tomato sauce. Sprinkle grated Romano cheese on top. Cover the top of the casserole dish with aluminum foil. If you live in a region where lump crab meat is not readily available, using shrimp in this recipe is an excellent alternative. By all means, use good quality lump crab meat in place of the shrimp if you can get it. Into a saute pan, add the canola oil, the cayenne pepper, a teaspoon of sea salt, red bell pepper, celery, onions, and garlic. Cook on medium low heat for 7 minutes stirring occasionally. Turn the heat off and let the vegetables cool. Into a large mixing bowl, add the mayonnaise, the beaten egg, the lemon juice, the Worcestershire sauce, the creole mustard, and three teaspoons of sea salt. Whisk all of these ingredients together until well blended. Add the parsley, thyme, the shrimp pieces, and the cooked vegetables. Fold all of these ingredients together. Add the bread crumbs and mix again. Spray a sheet pan with cooking spray. Spray a 1/3 measuring cup with cooking spray. Place the shrimp and bread crumb mixture into the 1/3 measuring cup to form a small cake. Drop the formed cakes onto the sheet pan making sure to space them out evenly. When all of the shrimp and bread crumb mixture has been formed into cakes, place the sheet pan with the cakes into a refrigerator for at least an hour. Brush the top of each shrimp cake with canola oil and sprinkle sea salt on the top of each one. Bake for 40-45 minutes until the shrimp cakes are golden brown. Note: You can put the shrimp cakes under the broiler for two minutes for a more crispy top. Serve with Romesco sauce (recipe follows) and lemon wedges. Brush the onion and the two garlic cloves with olive oil. Sprinkle the onion and garlic with sea salt and ground black pepper. Wrap the onion and garlic cloves in aluminum foil. Rub olive oil on the peppers and tomatoes and sprinkle them with salt and pepper. Place the onion and garlic cloves (which were wrapped in aluminum foil) along with the tomatoes and peppers on a baking sheet. Bake in the oven for 20-30 minutes until the skins of the peppers and the tomatoes begin to turn brown and blister. Place the almonds on a cookie sheet and roast in the same oven for 3-4 minutes or until the nuts turn light brown. After the peppers cool for 15 minutes, peel off most of the blistered skin and remove the core and the seeds. Into a blender, squeeze the roasted garlic flesh out of their skins (like squeezing toothpaste). Add the peppers, tomatoes, onion, and any of the roasting pan juices. Blend until smooth. Add the bread, a teaspoon of sea salt, a teaspoon of ground black pepper, the red wine vinegar, almonds, and the anchovy paste. Blend until smooth. Taste the sauce and add more sea salt and/or black pepper if desired. Pour the sauce into a serving dish and refrigerate at least 30 minutes before serving.